Migration in Europe is not free of challenges. Especially in the case of care, migrants often face a double challenge: (i) not to speak the language of the resident country, and (ii) be unfamiliar with its care and health administration. As a consequence, e.g., elderly migrants in care homes suffer from social exclusion, with their relatives also struggling with getting the right information and interacting with the administration, migrants at home are often reluctant to go to see the doctor in case of health issues. Migrant temporary care workers face the problem of isolation, lack of professional background information and deficient communication with both the cared and the supervisors. 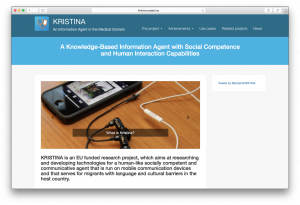 KRISTINA’s overall objective is to research and develop technologies for a human-like socially competent and communicative agent that is run on mobile communication devices and that serves for migrants with language and cultural barriers in the resident country as a trusted information provision party and mediator in questions related to basic care and healthcare. KRISTINA will advance the state of the art in dialogue management, multimodal (vocal, facial and gestural) communication analysis and multimodal communication. The technologies will be validated in two use cases, in which prolonged trials will be carried out with a representative number of migrants identified as especially in need: elderly Turkish migrants and their relatives and short term Polish care giving personnel in Germany and North African migrants in Spain. For more information please visit www.kristina-project.eu. This project has received funding from the European Union’s Horizon 2020 research and innovation programme under grant agreement no. 645012.